Ellen Roosval von Hallwyl was an early Swedish modernist sculptor. She was unique in that she carved her sculptures herself. Ellen Roosval von Hallwyl was the daughter of the Swiss Count Walther von Hallwyl and his wife Wilhelmina Kempe, the heiress of the wealthy sawmill owner Wilhelm Kempe. Ellen Roosval von Hallwyl’s childhood followed the norms of the newly wealthy aristocracy, who adopted codes of conduct from the royalty. When she was 20 years old she married Lieutenant Henrik de Maré, who in 1897 was appointed Swedish military attaché to Berlin. She began her art studies there under Hedwig Weiss, a member of Verein der Berliner Künstlerinnen. In 1904 Ellen Roosval von Hallwyl returned to Sweden as her husband had been appointed to a new position at the royal court. During their time in Berlin the couple had employed the young art critic Johnny Roosval as a tutor for their 13-year-old son Rolf. When Ellen Roosval von Hallwyl in 1906 sought a divorce from her husband in order to marry Johnny Roosval, it caused a great scandal in high society, not least due to the age difference between the couple – Johnny was twelve years her junior. She spent the year of her divorce, from 1905 to 1906, with her maid in Berlin and painted at the Secession school for Lovis Corinth, amongst others. In 1907 she finally married Johnny Roosval even though this resulted in her being ostracised from the Hallwyl family. It was only eleven years later, once Johnny Roosval had become a lecturer and was set on the path of becoming a professor, that the Hallwyl family finally accepted their marriage. Ellen Roosval von Hallwyl’s paintings are dark, laden with symbols, and sharply contrast with the square figures of her sculptures. From 1910 her main form of expression became sculpting. Johnny Roosval managed to persuade Carl Milles to give her lessons in her studio. She spent the winter of 1912-1913 in Paris with Gaston Touissant, who was a student of Bourdelles, in order to learn the practical techniques of stone masonry. She thus became the first Swedish woman to actually carve her own sculptures, frequently on a very large scale. One of her first commissions was a four-metre tall funeral cross in granite for her niece Ebba von Eckermann, to be placed at Frustuna cemetery. It was reminiscent of the triumphal-crucifixes found in Gotland, which was part of Johnny Roosval’s research field and where they had a summer cottage called Villa Muramaris. The villa had been partly financed by Ellen Roosval von Hallwyl, and it was completed in 1917. Its form and decoration was Ellen Roosval von Hallwyl’s principal piece of work. The walls were erected around the magnificent sandstone fireplace in the centre of the building. Ellen Roosval von Hallwyl had created the fireplace in the shape of an Egyptian temple façade, with two monumental female figures, symbolising Kärleken (love) and Sanningen (truth), surrounded by male figures Smärtan (pain) and Arbetet (work), supported by the four elements. For the southern façade of the villa she used medieval templates for the fountain pieces Kärleken and Synden (sin); their so-called Baroque garden housed a statue of Bacchus and some putti. The whole complex was a well-thought out unified piece of art. The stand-alone sculpture Daimon, portraying a naked youngster reaching up towards the sky, bore the deepest symbolism. He is the emblem of her guardian spirit, the divine voice which inspired her to create and which guided her. Ellen Roosval von Hallwyl was deeply religious and believed that her creativity came from God. Villa Muramaris was declared a historic building and thereby given protected status in 1987 but had still not been made fire-proof when it was ravaged by fire in January 2013. When her family’s excommunication had ended in the 1920s Ellen Roosval von Hallwyl was commissioned by her mother to decorate the Hallwyl palace. She created the series entitled Livet i Kristus for the skittles room, comprising eight bronze statues in a mix of Indian and romantic styles. In 1925 she designed Dansen in honour of her son Rolf de Maré, the creator of the Swedish Ballet in Paris. In 1933 the same dance composition was used for a granite relief, which can now be seen in the garden of the Swedish Institute in Paris. After her son had displayed some of her sculptures on his home stage, Théâtre des Champs-Elysées in Paris, Ellen Roosval von Hallwyl decided in 1923, aged 56, to hold her first and only individual exhibition in Stockholm. The reviewers were surprised that “a lady from the cultural elite” could have so little feminine charm: “One is amazed that a woman could come up with such creations, like these peculiarly brutal masks”, whilst simultaneously accusing her of being “femininely fancy”. Her principle mistake was probably only that she had dared to enter “a struggle with the most audacious male problems”. Sculpting was still seen to be a male domain at the time. In the 1930s Ellen Roosval von Hallwyl was struck with rheumatism, and her doctor advised her to stop sculpting. She managed to complete some gravestones and then turned to music, which she believed to be purer and more spiritual than sculpting given that it did not require material. Ellen Roosval von Hallwyl was an accomplished pianist and took lessons in composing from the German composer Friedrich Mehler, who was active in Visby. They were both fans of Gustav Mahler’s music. Ellen Roosvan von Hallwyl died in Stockholm in 1952. She is buried at Väskinde cemetery on Gotland where she lies under a gravestone she made herself, called Kristus tröstaren. 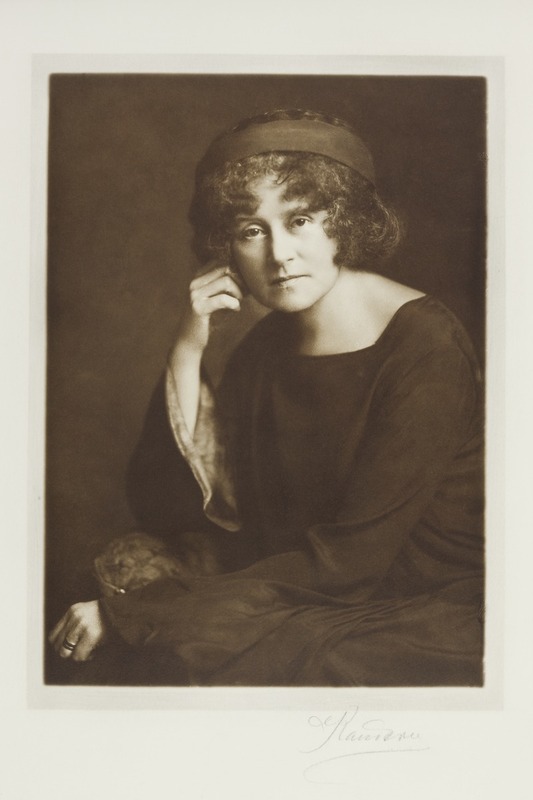 Ellen Fredrika Wilhelmina Roosval von Hallwyl, www.skbl.se/sv/artikel/EllenRoosvalvonHallwyl, Svenskt kvinnobiografiskt lexikon (article by Irja Bergström), retrieved 2019-04-19.